Background: Atopic dermatitis is a common chronic disease with a genetic background known as atopic syndrome characterised by pruritus and cutaneous inflammation. This review provides conventional and modified approaches for the treatment of atopic dermatitis treatment. 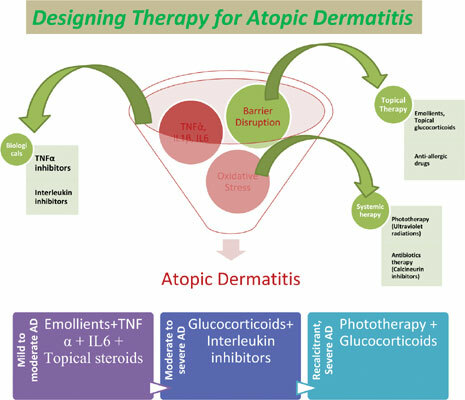 Objective: The objective of this review is to provide an overview of the current and upcoming therapies along with novel approaches to improve the drug delivery for the treatment of atopic dermatitis. Methods: Common treatments of atopic dermatitis include application of topical corticosteroids, calcineurin inhibitors along with emollients and cutaneous antiseptics. However, severe forms of the disease are resistant to these approaches and need systemic treatments including immunosuppressants such as cyclosporine, systematic glucocorticosteroids and antihistaminic drugs. Results: Phototherapy including UV-B, psoralen plus ultraviolet therapy can also be used as adjuvant therapy in treatment of chronic AD. However, all these therapies have a number of side effects and potential problems, such as limited efficacy, inconvenience, organ toxicity, carcinogenic and broadband immunosuppression. The natural therapy including herbs and natural oils is also being utilized since many years for treatment of dermatitis, although more in vivo, dose and efficacy data needs to be established. Currently biological agents are being studied widely as novel therapeutic options for dermatitis treatment which can lead to less toxic and more targeted approach for the treatment of disease. Conclusion: The present review describes recent advancements and delivery approaches for safe and effective treatment of atopic dermatitis. Atopic dermatitis, treatment approaches, novel drug delivery, topical treatment, immunosuppressants, natural therapy.